Making friend is easier when you are willing to help others learn. — Shooter’s Like Us night at the Wake County Range — April 2016. When I started shooting it was a solo pursuit. I didn’t think I knew anyone I could ask to teach me and then, once I got started, I had trouble finding other shooters I could share this new passion with. Why does that matter? Because making friends who shoot will give you access to a wide range of personal experience, encouragement and support in your pursuit of firearms skills and safety. I got lucky. When I showed up to my NRA First Steps Pistol class, one of the instructors was an old friend I’d lost track of from over a decade ago. Neither of us were shooters before. She let me shoot some of her guns and helped me select my first pistol to purchase. That was a S&W 22A chambered in .22LR. She made me aware of a Ladies Handgun group that met once a month. That seems to be unique to women, as I haven’t heard of a support group for men in shooting, but it was a great resource for me. They helped me select my first 9mm handgun: an XDS by Springfield Armory. I since sold both of these guns, but they were good starting options. I began networking with people I already knew as I became passionate about shooting. I wasn’t shy about sharing my new interest. After dozens of conversations with gun friendly people, I realized that many firearms enthusiasts don’t actually shoot that often. They have knowledge from the past, or they collect firearms, but due to lack of time or money, they didn’t actually shoot that often. I wanted to go to the range 2-4 times a month as I was building my skills. I voiced my frustration about people who said they liked to shoot, but didn’t seem to make it to a range. One of my friends who was in that category suggested I talk with a mutual acquaintance I wasn’t aware was a shooter. BINGO! I found a fellow fanatic who talked me into taking classes and then to shoot our first competitive match together. I can’t thank him enough. So keep networking patiently and consistently. It pays off. 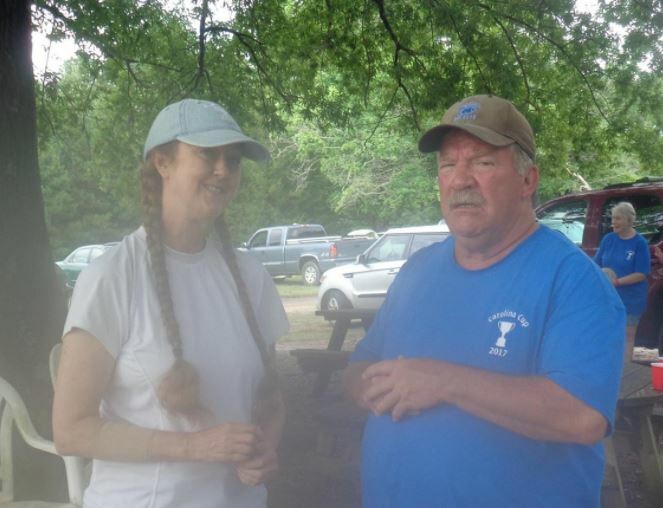 Shooting handgun competitions made shooting even more fun for me. And it made me much safer as a shooter. I found shooting a single target in a lane at a shooting range became very tame. One of the folks I met locally posted this to Facebook and I agree wholeheartedly: “Remember, a shooting match is just a social event occasionally interrupted by gunfire.” I don’t place well in matches, but I consider it a good day to shoot with friends. It’s great to have access to first hand opinions about other equipment, be able to ask for references on where to buy a gun or find a good gunsmith, and even have friends that can lend you equipment if you have equipment failures. I have one friend that has installed aftermarket triggers for me. In return I’ve helped him clear brush from his private range. Even though shooting can be a rewarding solo experience, I have found having friends in the sport to be very beneficial. Expect people to be a bit cautious. They need to see that you are safe with firearms. Look for folks that are looking to make a similar time investment. If you are a once a week shooter, you will annoy someone that wants to shoot a few times a year. Not all shooters are into what you are into: there are many niches in the shooting sports. Respect the differences and look for other shooters that share your particular passion. If you join a club, they need to see that you will keep showing up before they invest in you. So keep showing up. If you are interested in an event or competition, volunteer. Then show up as promised and fulfill your volunteer commitments. That is probably the #1 way to get to know people. Once you make one friend, that person will introduce you to others. Before you know it, you have access to the knowledge and experience of many. All photos courtesy of Parrish Brian. The camera got soaked in the rain so the images suffered a bit, but the full set for the 2017 Carolina Cup can be found here on Facebook. To read the first part of the article, go back to Part 1. I started a new job about a month before this match. I had not been shooting as I was focused on coming up to speed at the new job. I had one floating holiday I could use for time off as I hadn’t earned any vacation days. So I didn’t shoot the match. I volunteered instead. The volunteers who do shoot the match do so prior to the match. This year that was on Thursday. 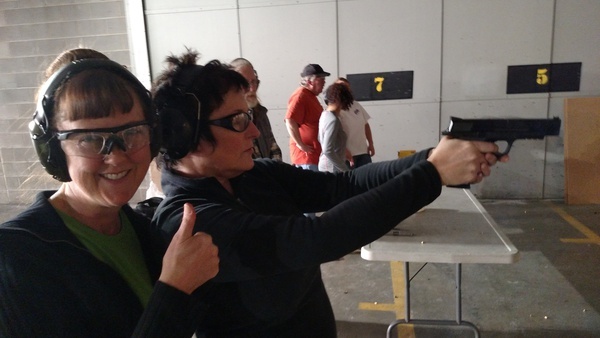 The big smile in the photo above shows that I think any day on a range is a good one, even if you are not shooting. This match is scored on paper. It’s a two part form so a copy can go to the shooter as soon as the stage is scored. The challenge is to remember NOT to keep the current score card at the top of the stack. If you do, the writing will go through at least 2 other scores card carbons. Ask me how I know…. 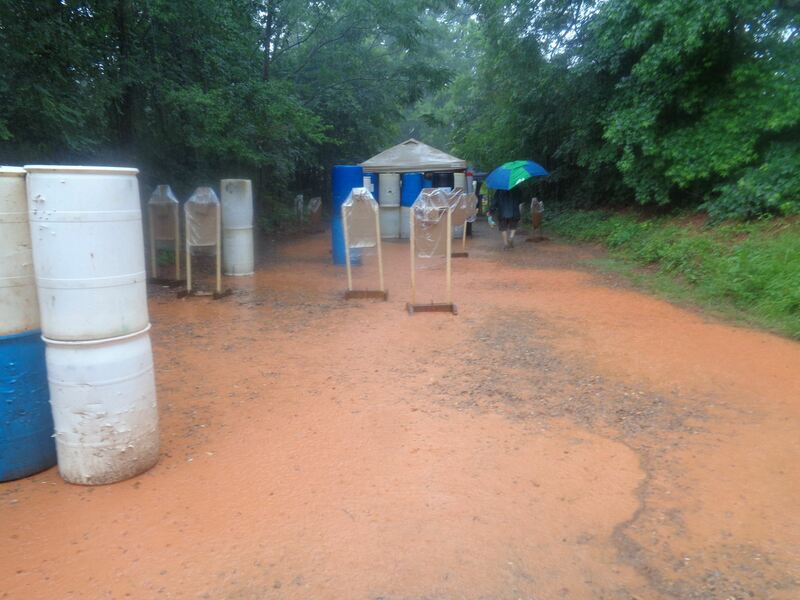 It also is a challenge to keep them dry when running shooters in the rain. An umbrella works OK but it’s hard to juggle a clip board and an umbrella and paste targets. You can read scores just fine on damp score cards though so it works well enough. We ran Stage 9 and Stage 10 in Bay 5. We had more squads come through Friday than Saturday. I believe their were 12 squads total for the match. I think the largest was 8-10 shooters and the smallest we saw was 4 shooters. If you’d like to see a shooter bang out our stages, Ben Berry started on our bay and you can see both at the beginning of his match video. He shot Stage 10 first (the bread truck stage) and Stage 9 next (the standards stage). Rusty is calling the commands for both stages in this video of the entire match. Stage 9 was a standards stage. There were 3 targets and the instructions were straightforward. The stage was limited. That means the shooter could not take any make up shots, only the exact number of shots required by the stage was acceptable. Start from the back shooting line. Shoot 2 shots on each of 3 targets. Reload. Again shoot 2 shots on each of 3 targets. The short version is “6 reload 6”. At this point, the shooter is instructed to reload and reholster their gun. Then we record the time for the first string of shots. The shooter moves forward to the next shooting line. Instructions are to shoot the same 3 targets but this time shoot one shot on each target strong hand, move the gun to your support hand and again shoot one shot on each target.After the shooter unloaded and showed clear we recorded the time for the second string. Then we scored the targets looking for 6 shots each. And yes, there were a few shooters that didn’t follow the instructions. Any extra shots resulted in a procedural penalty. Then when scoring the target, we pasted over one of the best shots and scored the rest. Any shots taken with the wrong hand on the second string resulted in a procedural penalty. What was the most procedural penalties we gave? I walked Frank through the penalties: The shooter took a make up shot on string 1. That was the first penalty. Then the shooter shot all 6 shots strong hand on string two. There were 3 penalties for taking the second shot strong hand and 3 penalties for taking no shots with the support hand. I had two shooters do this. But that made a grand total of 7 penalties for one of our shooters. Frank shook his head, grinned in sympathy, and headed back to the office. He wanted verification and I provided it. Stage 10 was shot inside a bread truck. There were 8 targets total. Two shots each. Instructions were: Start standing beside the driver’s seat facing out the driver’s door. Shoot one target straight ahead (obscured by a junk car). Turn and shoot two targets out the back of the truck behind a short hill. Move forward and slice the pie out the side window of the truck with two targets – each shot through the windows of junk cars. Move forward and shoot two targets directly behind the van flat on the ground and finally, turn left to shoot the last target far to the left of the back of the van. At this point any desired makeup shots could be taken. Only one shooter shot this stage clean the entire match. It was challenging. 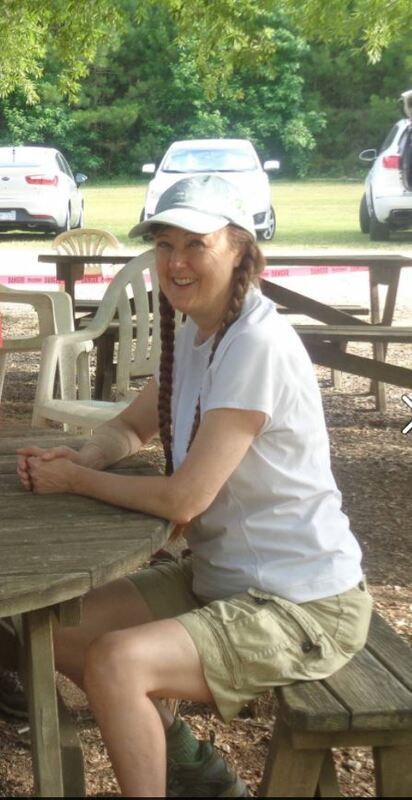 We had a wide variety of shooters: old, young, in jeans, in tactical gear, in shorts, in dull colors, in bright colors, with very short hair, with long hair & long beards, men & women. Only one of the shooters that passed through our stage seemed to be unaware of IDPA rules and wanted to argue about them. Otherwise we found the shooters to be safe and courteous. Since I didn’t work stats I don’t know the total number of shooters this year but I think it was 100 -150 shooters total. Our oldest shooter was 83. He was not fast but he was very accurate. I hope I’m still shooting at 83! My right foot and left knee were really hurting by the end of the day Friday. You spend a lot of time on your feet running a stage. I spent Friday night on the couch and that was all I needed to recharge. Saturday wasn’t as demanding because but we had more breaks and fewer shooters. We were done running shooters in our bay by 2:30 pm Saturday. Based on our experience with the rain the day before, we broke down the bay while it was dry and had everything packed away prior to the massive rain storm late Saturday. This year there were only a few minor injuries. No ambulances were called. The awards ceremony was preceded by dinner with excellent BBQ pig right off the grill. It’s a Carolina Cup Tradition. You can smell that pig cooking all Saturday afternoon. After the awards ceremony Frank announced this was the 18th Carolina Cup and it would be the last that he would host. That made the experience a bit bittersweet but I was extra glad I made the effort to participate. There were a few rumors that there would be another Cup, possibly hosted by someone new. It’s as much a family reunion as it is a shooting match and I know many folks want to continue to return for that reason. Frank & Paula may be up for attending rather than hosting in the future.Time will tell. 2017 Carolina Cup / Sadie & Rusty waiting for BBQ before the awards ceremony. Frank & Paula Glover: Welcome to the 2017 Carolina Cup! All Photos by Parrish Brian. 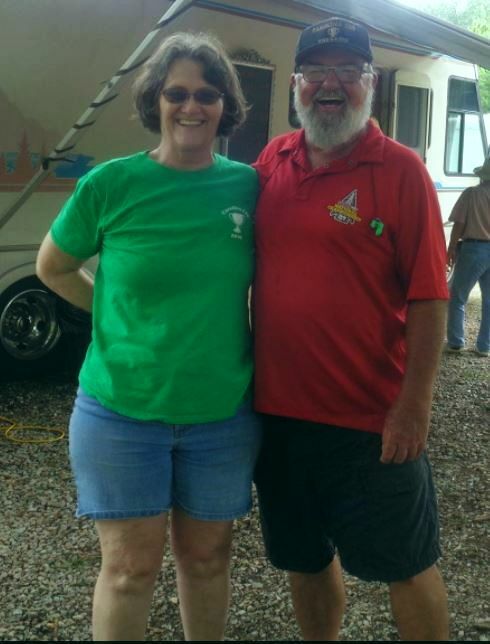 After several years of volunteering for the Carolina Cup at The Range in Oxford, North Carolina by working on the stats team (data entry for scoring), Frank asked me to work as a Safely Officer on one of the bays for the 2017 Carolina Cup. I started running scoring at various local matches and I felt comfortable with that. I agreed to work the Cup also because the leader of the group I would be working with is one of the safest shooters I know. I worked Bay 5 with 3 other safety officers. Our Team: Rusty, Hal, David and Sadie. 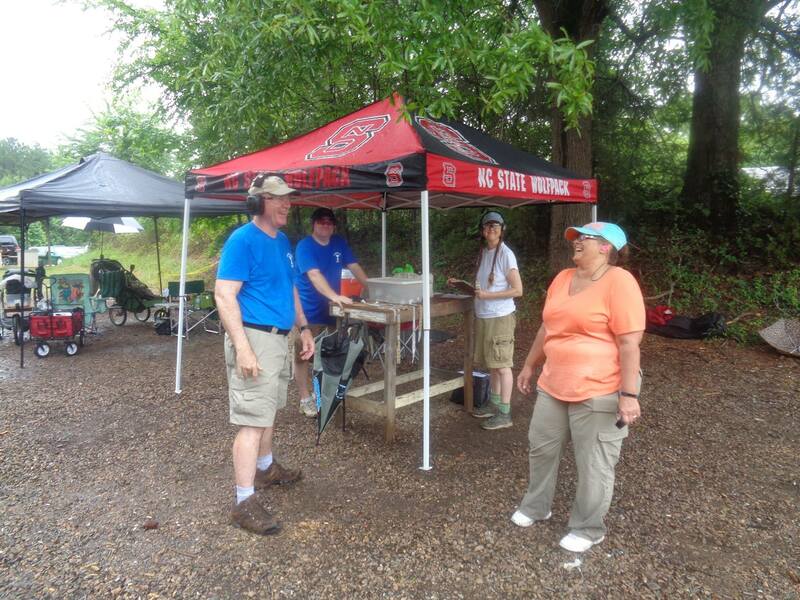 We also had an additional volunteer, Joe, for part of Saturday. Rusty was the team lead and my primary point of contact for planning. Instructions were fairly simple: he told me what time to show up. The rest was inferred: Plan for sun or rain. Come with everything you’d bring to a match except your shooting gear. Turns out that water proof boots were a plus. My feet stayed dry. Call who is in the deep hole. So a shooter should get a heads up about 3 shooters in advance of actually shooting.And they will get a reminder of their position as they move toward shooting. I had a hacking cough for at least 10 days prior to the match but I figured if I could go to work, I could work the Cup. My voice was a bit squeaky toward the end, but it held out. We started at 7:30 am Friday and 7 am Saturday. I live an hour away so these were early mornings for me. I always make time for breakfast. I took my first and only vacation day at a new job to work the match. Why did we start earlier on Saturday? That is the morning for the traditional photo of all volunteers in the event t-shirt. This year we were all in Royal Blue. You can see it on Facebook here. The match had a total of 14 stages, two stages per bay over 7 bays. No stages were shot across the road in the trees this year. Each had unique challenges. Frank is known for offering the unexpected. He didn’t disappoint. 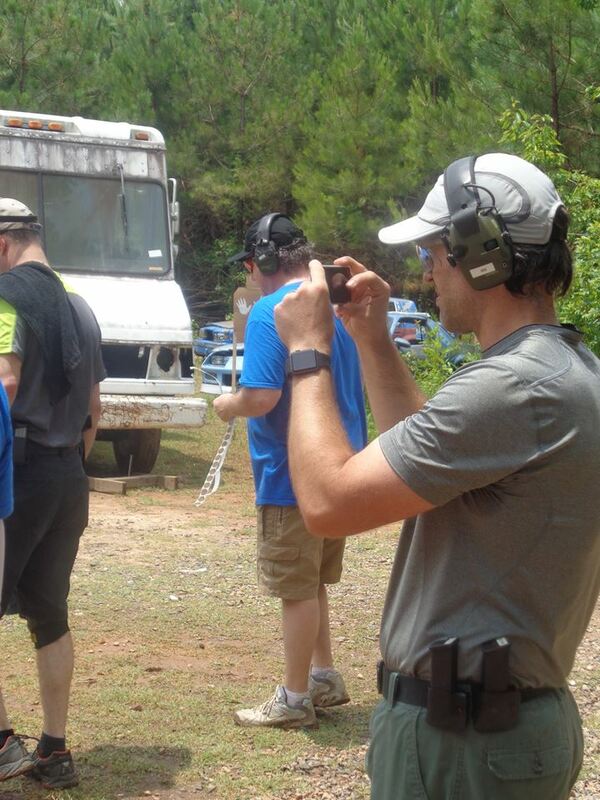 Since the match is no longer sanctioned and bound by IDPA rules, various bays offered challenges across a variety of pistol sports: zombie shooting, steel stages and traditional IDPA stages. On Bay 5, our responsibility for the match, the match director supplied one canopy. 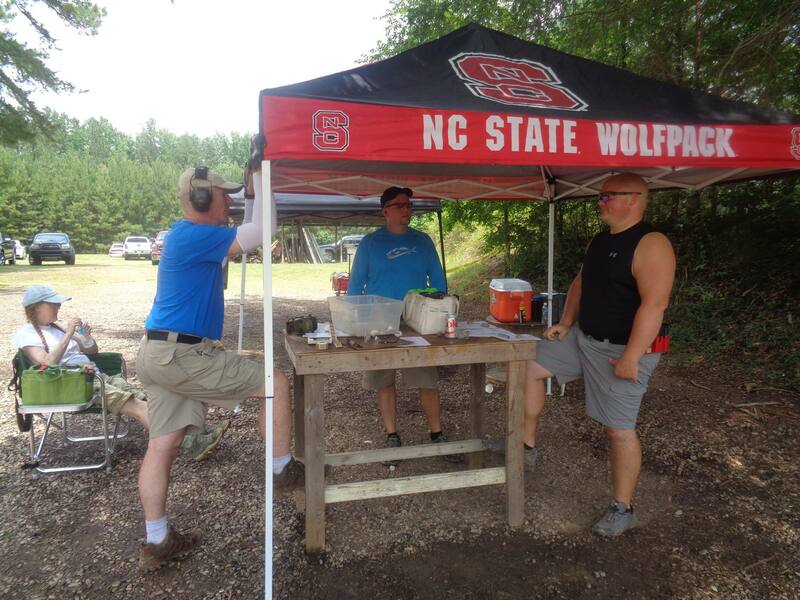 One of the volunteers I worked with, Hal, supplied another (note the NCSU logo). These canopies provide shade in the sun and cover in the rain. They are critical for a good match experience. Hal also brought a cooler with water & ice too. There are a couple of volunteers who’s job it is to drive a Gator around to distribute water and pick up scores during the match, but it was very nice to have a cooler with drinks handy in the bay. 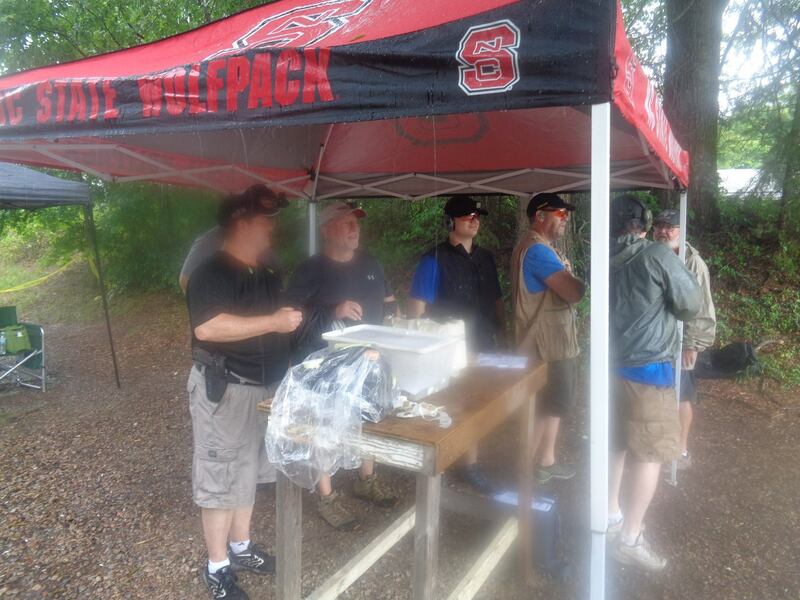 Carolina Cup 2017 / Bay 5 / Shooters sheltered from the rain. As for weather, we saw it all. We ran shooters in a light rain on Friday morning. Then we ran shooters in the sauna that was created by hot sun burning off the rain in the afternoon. Due to the Friday morning rain, we also found every hole that was just waiting to become a puddle. One was so deep and was stepped in so many times we named it in honor of the first guy that fell in. “Hal’s Hole: deep enough to soak your cleats.”. Running shooters in the rain is slow. We dropped clear plastic bags (dry cleaning bags?) over every target to keep it as dry as possible. Here is the adult part of this post: These are unofficially known as “target condoms”. Yes, I really wrote that. Here’s a photo that Parry took showing these babies in action. As you score the stage you must lift each plastic bag to apply a sticker over every hole. in the target. These are called target pasters. They are very difficult to use when they get damp, much less wet. It slows things down considerably. I tried also juggling an umbrella. The umbrella was to attempt to keep the score sheets and pasters dry – with limited effectiveness. We did the best we could do under the circumstances then appreciated the sun when if finally dried things out somewhat. On Saturday we lucked out and were only running shooters when it was dry. It rained at lunch and then in the late afternoon we had a serious downpour. Neither impacted our shooters. But Bay 1 essentially flooded with the Saturday afternoon downpour and they did still have shooters in process. The link above to show rain proofed targets also shows the flooded version of Bay 1. I’m going to wrap up Part 1 of this post, but not before mentioning the highlight of the day Friday: lunch. 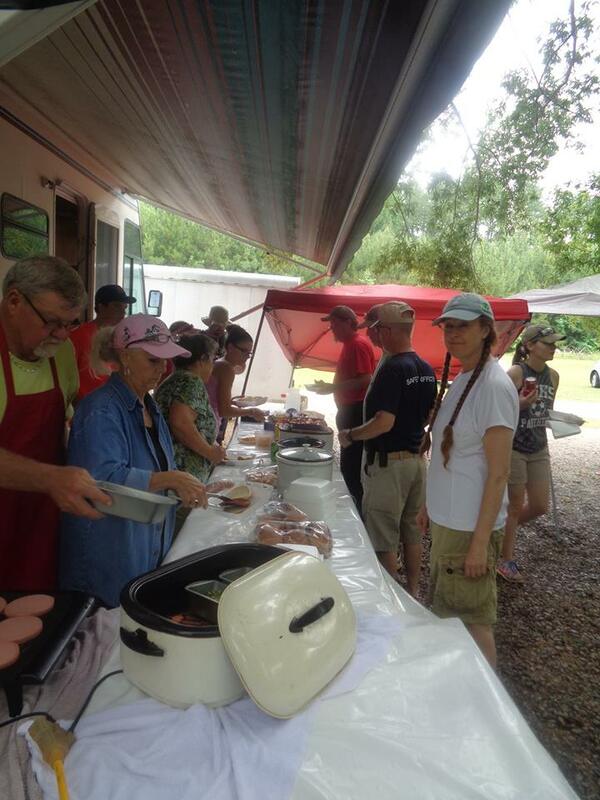 We had the traditional southern offering of a bologna burger or a hot dog. I can get hot dogs many places, but I only get the opportunity for bologna burgers at the Cup. I figure I can indulge once a year. They have a food vendor onsite to handle the rush of hungry shooters at lunch both days.The selection is limited but the food is hot and the service is fast. 2017 Carolina Cup / Sadie in line for Friday lunch. More on the match and my volunteer experience in Part 2. Technical Glitches with the Blog – Fixed! I realized I was not getting notifications of comments when I had visitors to the blog. I got on the phone with my hosting company last night and got that sorted out. I appreciate all comments and I apologize for being slow to respond this spring. I should be much more responsive in the future. I haven’t been shooting as much recently due to a change in employment. I was with my previous employer just shy of 8 years. I found shooting and explored shooting pistol matches all while working for that employer. My co-workers were gun friendly and I got to the point of taking that for granted. I haven’t opted to bring up the topic of guns with my new co-workers. Yet. That may be a future topic for the blog.